Weighting evaluations and attaching them to a faculty search should only be performed AFTER all applications have been received and AFTER all ratings have been performed. If any additional ratings occur after performing the weighting of ratings, then this process will need to be repeated for the Search Committee to receive updated information. For some search committees there ratings that are more important than others. For instance, 'Teaching Experience' may be twice as important than say 'Scholarly Publications', and you want this knowledge to be accessible by every member in the search committee from one place. 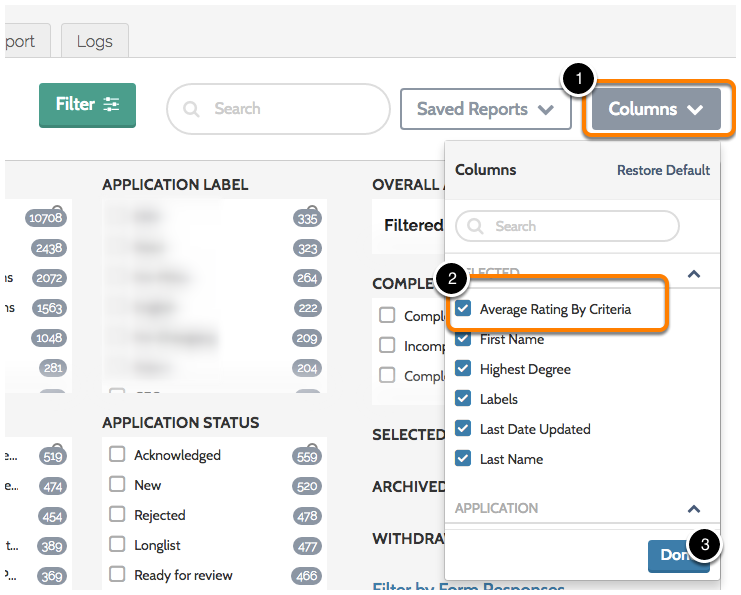 From the Dashboard, navigate to the Reports page to run an Applications Report. 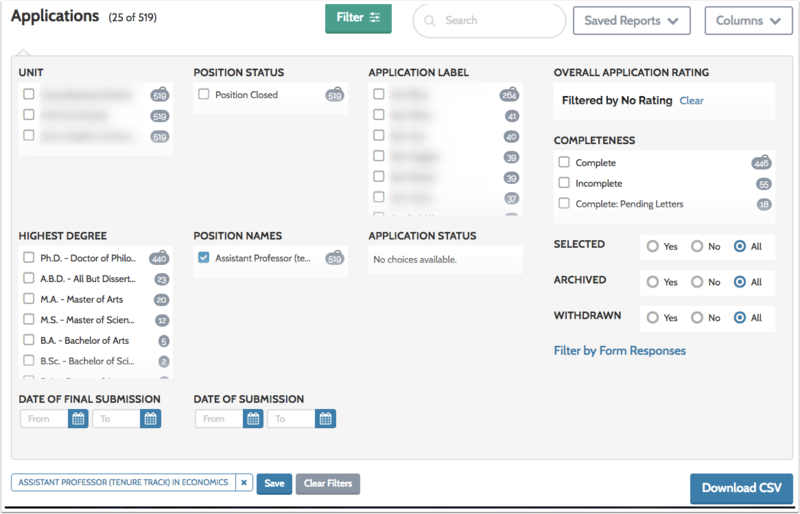 After selecting Reports, by default, the Applications Report screen will display. After selecting the relevant Position Name, navigate to the 'Columns' button and be sure to check 'Average Rating By Criteria'. 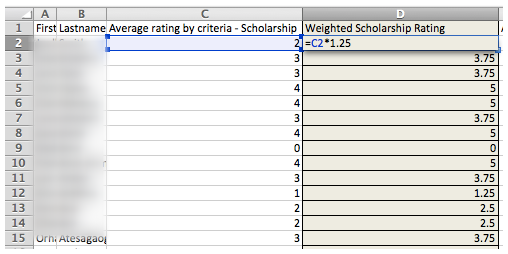 You can also add any other relevant fields that are desired to display in the final document for the search committee. After selecting 'Done', the report information will populate beneath the form. Now you are ready to download the data. Select the 'Download CSV' button to download the table of information from the report in a CSV File. Be careful to note where you downloaded the file onto your machine. You will need to be able to find it to open it in your preferred calculations software. There are many programs available to do this type of modification (Microsoft Excel, Google Sheets, etc). 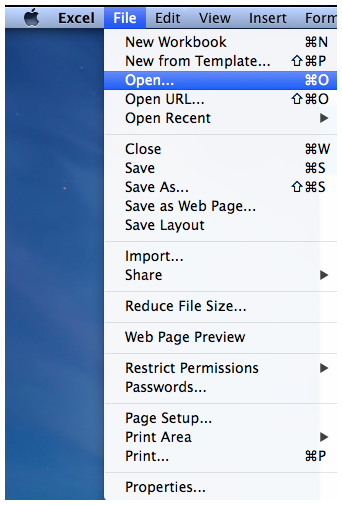 This article uses Microsoft Excel 2013 for Mac. After launching your favorite spreadsheet software, open the CSV file. After your file is open, you will need to create a new column for every criteria you are going to modify. It will likely look similar to the below image. The beige columns have been added, titled with 'Weighted' and formatted for easier identification. Before you start creating calculations, it is important to identify what criteria are going to be weighted and by how much. This formula causes the originating cell to pull data from cell E2, which is the unweighted Community rating. Copy the calculation downwards using the auto-fill tool to update the entire column. Click-and-Drag the formula down to the final cell in the table. Auto-Fill tool is the square-node that is in the bottom-right of the selected (or active) cell. After releasing the mouse, your formula will be copied through the selected cells. Note the formula below: C2 is the cell where the data is originating, 1.25 is the modifcation to the weight of the value. Use the Auto-Fill tool to copy the formula downwards, similar to Step 3 in this progression. After you finish weighing and modifying all of your Ratings, make sure you eliminate any extra information that you do not want to be considered. Save your now Weighted CSV file as a PDF. In the picture below, note that it is important to perform 'Scaling' when exporting your document. If you have a lot of criteria (columns), you will want to make this more than ONE page wide, and also may want to copy your headers onto every page. Here is a guide that can assist you with that. The file must be uploaded to committee documents as a PDF format. 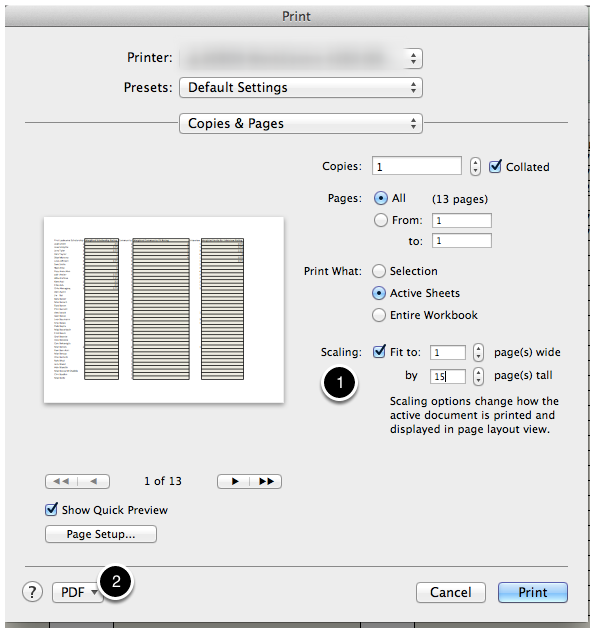 The file must be uploaded to committee documents as a PDF format. See the 'How to Weight Ratings' section above. After selecting the relevant positon, click the Position Actions button and then the Edit Position option to edit any internal notes and add the Weighted Ratings PDF. On the right side of the screen, select "6. Internal Notes"
Click the 'Add File' button at the bottom of the page to upload your PDF for the Search Committee to access. 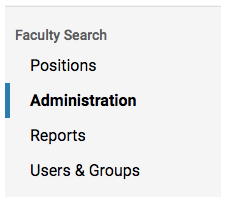 After you have uploaded your file to the position's internal notes, any search committee member can access it via the "View position Details' page within the Position Actions button.